When I was first out of the Army, some 40 years ago, I went to work, briefly, as a trackman on the Missouri Pacific. I worked with a track crew in Neff Yard, in Kansas City’s east bottoms. Tamping track involved leveling the rails by means of a heavy jack and a bubble level. Also, the foreman would put his face on the rail and check it visually. Wherever he pointed out a sag in the track, I would dig a hole under the rail and set the jack in place. The foreman would indicate how high to jack up the rail. Then the tamping machine would come along and push the ballast under the ties to level up the track. Just before the machine reached the jack, I would yank it out of there and trot down the line to the next sag and dig another hole. The problem was that the tamping machine could not work where there were switches. And a rail yard has lots of switches. There we had to do it by hand–or rather by foot–for we would use our shovels and our feet to force the ballast under each cross tie. We would kick the shovel repeatedly, thus forcing the crushed stone to fill the void under the ties–every single tie. Sometimes we would have to vacate a track for a few minutes so the yardmaster could send a cut of cars down our line. If we were lucky, those cars might sit there for five or ten minutes before being shuttled somewhere else. And if we were really lucky there might be a string of cars sitting on an adjacent track. And we could stand in the thin line of shade that they cast and lean on our shovels and wipe the sweat from our faces. I was young and in a hurry. I didn’t stay with that job for long. For nearly a century most railroads governed the movement of trains by a set of rules known as Time Table & Train Order (TT & TO). In it’s simplest form, it meant that trains ran according to a time table when applicable. But when a train was late, or ran as an extra movement, then its progress was governed by written orders generated by the dispatcher. If a given order was missed or forgotten, it often resulted in dire consequences. That possibility is addressed in some of the tales in Old Time Railroad Stories. 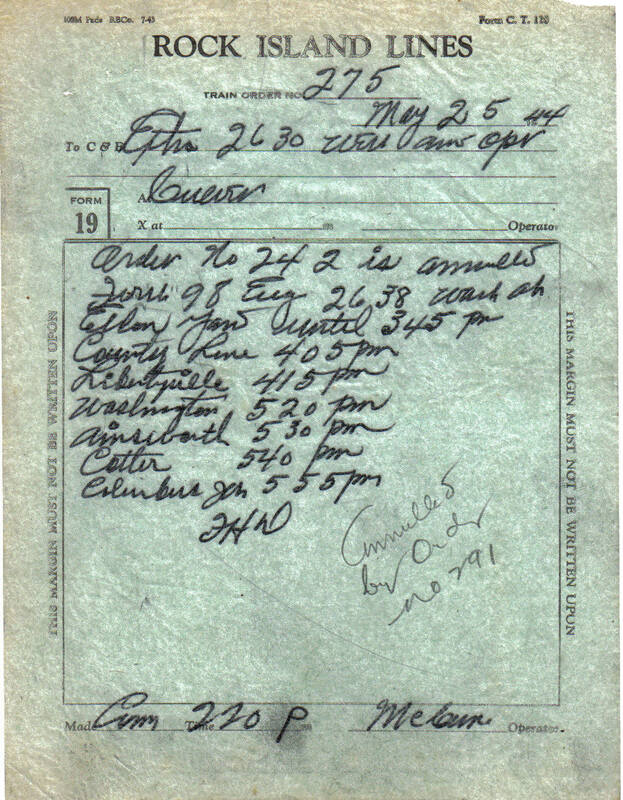 The written train order itself was known as a Form 19 or Form 31 (depending on whether or not the train crew had to stop and sign for the order.) The form was printed on tissue-thin paper so that it could be read at night by holding it in front of a lantern light. The light would shine through it and illuminate the words. 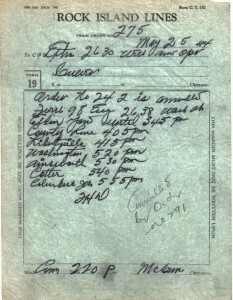 Because of the thin paper, a train order was often referred to as a flimsey. This train order went to the conductor and engineer (C & E) of Rock Island Extra 2630 West. It instructs the crew that the first section of train 98 (an opposing eastbound train) will wait at various locations until a given time. The TT & TO system is no longer used on the railroads. Flimseys like the one above are now collectors items. They are part of a fascinating hobby known as railroadiana. I’m often asked what got me interested in trains and railroad history. The fact is that I can’t remember not being interested in them. Certainly, growing up within sight of an active rail line had some part in it. But if I had to point to just one thing, I would say it was a Lionel train set that I got as a Christmas present in 1954. Oh, what an amazing toy that was! My dad helped me put together the track and attach the transformer. Then we placed the engine and cars on the track and let ‘em rip. Wow! The engine seemed to fairly fly as it tore around the loop, the side rod a-blur as it tried in vain to catch up to the caboose. As far as I was concerned, there was only one throttle setting–full blast. But the engine, heavy as it was, couldn’t take the curves that fast. So after several re-railings I learned to slow it down a bit. We had placed the track on a linoleum floor, and it tended to scoot around with every circle of the train. Over the next few Christmases I acquired some accessories to go with the train set. I recall getting a whistle house and a crossing gate and a helicopter that took off from a flatcar. And later still I received a second train set with a figure-eight track. So we mounted both layouts on a sheet of plywood. 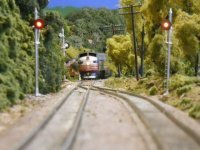 Much later, when I had a family of my own, I began working on an HO-scale layout in my home, complete with scenery and buildings and the works. My present layout is my third revision of it. So what about you? Chances are that you like trains as much as I do. How did you first get interested in them? 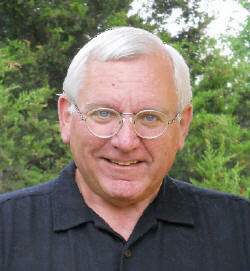 Michael Gillespie’s entertaining new railroad history is now available online. It seems that a signal gang was working at a certain location on a warm summer’s morning. This was before the days of long welded rail; the GM&O rails consisted of 39-foot sections, with each section bolted to the next by joiner plates. 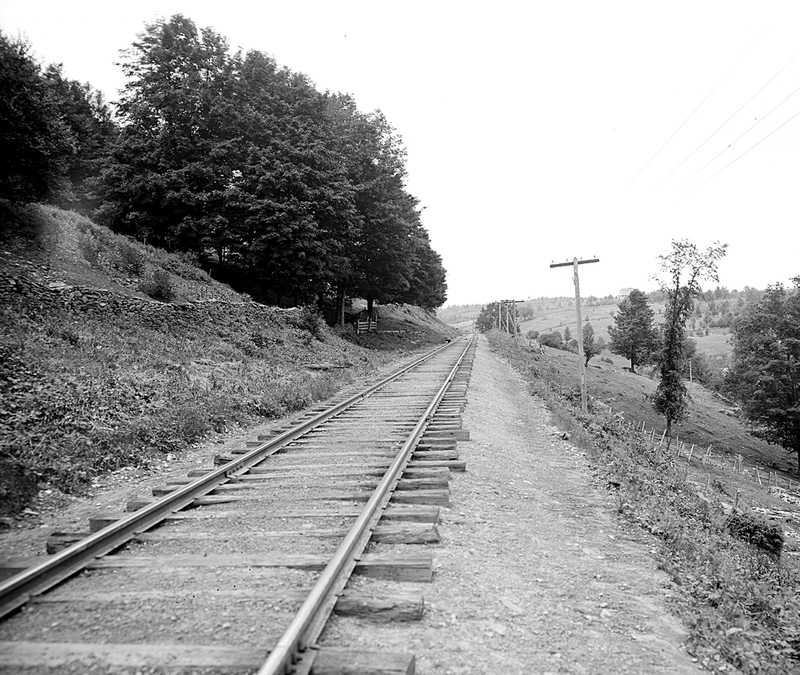 The steel rails would contract slightly during the night, leaving a small gap between the rail ends. By mid-morning, with the sun bearing down, the rails would expand suddenly, with a pop. On this particular morning, one of the signal workers sat down on the track, exactly at the point where two rails joined. There came the usual pop of the expanding rails, followed by the howl of the unfortunate worker. It seems that the rail ends pinched a bit of his tender behind between them. And he couldn’t remove himself from the trap; his fellow workers had to cut a bit of his skin off to extricate him. I don’t know if the story is true or not, but later when I worked a summer on a track gang, I always avoided sitting on a rail joint! Rail joints every 39 feet. Watch where you sit! It seems incredible that prior to 1900 most freight trains relied on brakemen to stop or slow down a train. The brakemen would walk the rooftops of the cars–one brakeman moving forward from the caboose, the other making his way back from the engine–and set the handbrakes of each car as they went. Beginning in 1900, federal law required that a train be equipped with airbrakes on enough cars so that the engineer could stop the train from the cab. But even that was a slow process inasmuch as the earliest type of airbrakes were slow to apply throughout the length of the train. So what could an engineer do in an emergency? According to the popular press of the day, the engineer would throw the engine into reverse for an emergency stop. But that generally-assumed technique doesn’t jive with the facts. According to an article written in 1908, any engineer who tried to reverse his engine in an emergency was liable to be fired. The approved way to make an emergency stop is told in the story entitled, “Remarks by the Wife of a Locomotive Engineer,” in Old Time Railroad Stories. On the surface, a train ride doesn’t seem an appropriate backdrop for a romantic story. Yet one of the yarns in Old Time Railroad Stories tells of a romance between a beau and his intended. And while it may have been a fictional account, I can assure you that romance does take place on the railroad. I know because several years ago I worked as a redcap for Amtrak in Kansas City. 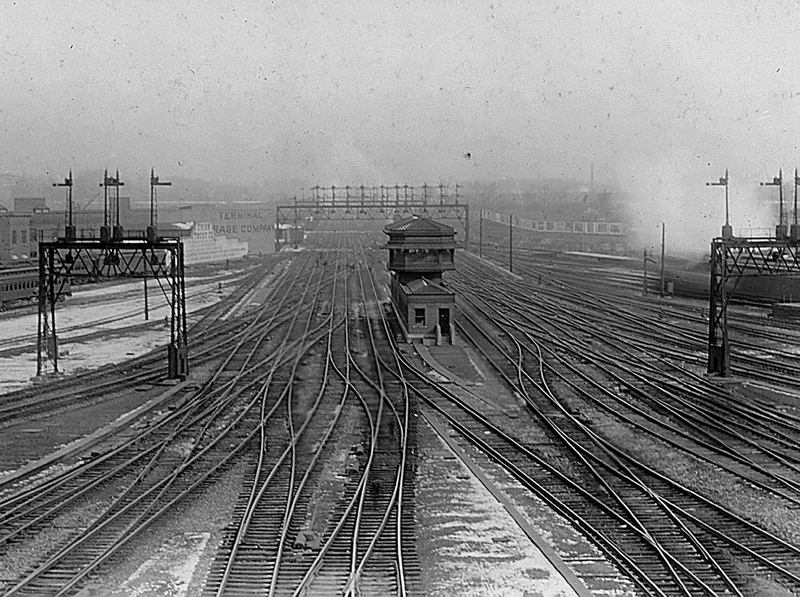 At 11:30 each night train number 3, the Chicago to Los Angeles Southwestern Chief, made a twenty minute stop in KC. My job was to take the boarding passengers’ carry-on baggage to the train and make sure it was placed in the correct car. On one particular evening, about an hour before train time, a large wedding party came into the station. This was something I had never seen before. The newlyweds had first class accomodation tickets to LA. I took their carry-ons and when the train arrived I put the pieces in their assigned room. On my next trip back to the waiting area, the best man handed me a bottle of champaign and asked it I could place it in the newlyweds’ room. I said that I could and for that he handed me a generous tip. I placed the bottle in the room and stood on the platform as the bride and groom boarded the train. A few minutes later the train pulled out. And a 33-hour honeymoon ride had just begun. I imagine the conductor collected their tickets before the train cleared the station tracks. 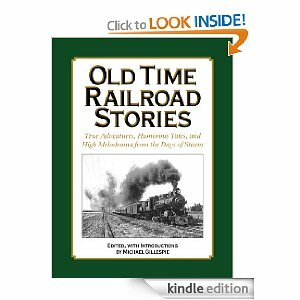 Many of the tales in Old Time Railroad Stories center around the threat of a train wreck. Train wrecks are something that have to be seen to be believed; they are big, messy, and dangerous. But considering all the train wrecks that have taken place over the years, very few are caught on tape or film. If you can watch this without flinching, then you must have nerves of steel. I am old enough to remember steam engines on the railroads–but just barely. The Missouri Pacific’s Sedalia subdivision ran near our house on the other side of a 40-acre field. I could see those engines clearly from our back yard. The westbound trains really slugged it out as they climbed a two-mile grade out of the Little Blue valley. Those big 2-4-2s put on quite a show as they worked their way to the summit. This was back in the early 50s. Yet my most vivid memory of a steam engine at work was a close-up view of a 0-6-0 switch engine in Kansas City’s East Bottoms. I was about five years old. I was in our car with my folks and the switcher blocked the road as it spotted some boxcars at a siding. We were stopped right next to the tracks, and as the engine moved back and forth I stuck my head out the window and the fireman gave me a big wave. I was thrilled that he noticed me. I was not so thrilled with the engine. It was big and ugly and stained gray from calcium deposits in the steam. Why did the railroad use such beat up relics, I wondered? Within a year that old tea kettle would be gone, along with all of her sisters. And if you had asked me at the time, I would have said good riddance to them. But what I wouldn’t give to see that old puffer belly out there today.